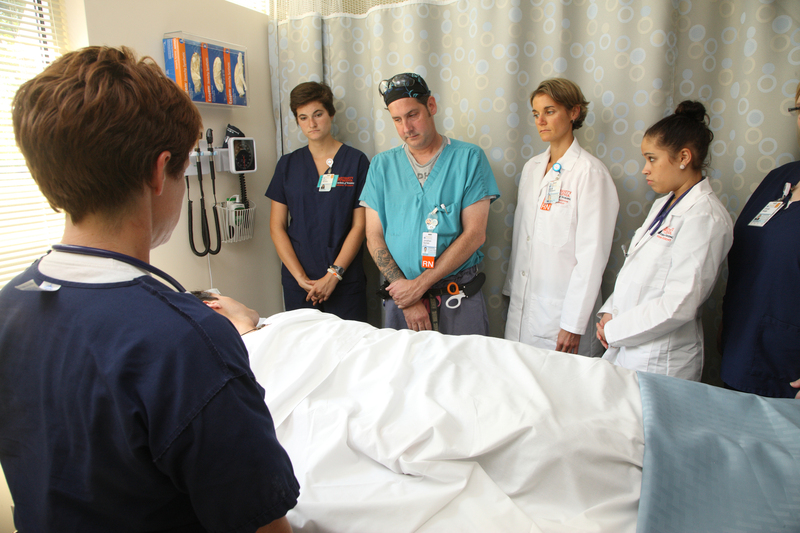 Jonathan Bartels (turquoise shirt) demonstrates “The Pause” at UVA School of Nursing. Jonathan Bartels, RN, of GGPHM’s palliative medicine section, has been in the spotlight recently for his work on the “power of the pause.” It is, as Bartels describes it, a way of ritually marking the death of a patient by taking a moment for silent reflection after his or her passing. Both the patient’s caregivers and any family members that may be present are invited to participate. “This practice brings back the humanity that has somehow been lost in the technology of modern medicine,” says Bartels. Bartels contributed a piece to the Spring 2016 edition of Virginia Magazine (the UVA alumni magazine) on “The Pause,” and his work has been covered in ACP Hospitalist, Oncology Nursing News, and in a segment on NPR (“Trauma Workers Find Solace In a Pause That Honors Life After A Death“).